I recall one of my sisters telling the story of how she was unable to lose weight no matter she did. Until she remembered to ask for divine help. Then she started dropping pounds. I‘m not sure if she thinks of Christ, God, Universal Consciousness or another manifestation or expression. That isn‘t what is most important. You are not alone! Quiet your heart. 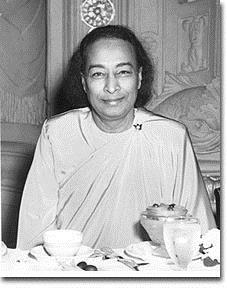 Speak to your favorite saint, your guru, to Divine Mother – or whatever expression of Divinity is most accessible to you. Remember that you are blessed. Are you looking to deepen your relationships with people? Do you want to serve others so that they can find inner peace? 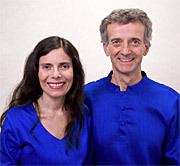 We invite you to explore your highest potential and learn to be an Ananda Meditation Teacher! This uplifting certificate training will help you to become the meditation teacher you truly want to be. 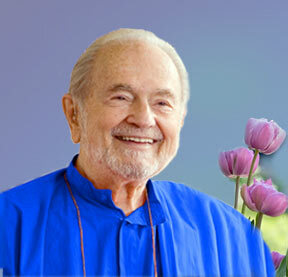 The in-person program offers you the joy of being at the Expanding Light in our ashram setting, a comprehensive 10-day certificate training, and inspiring and professionally presented classes taught by some of Ananda‘s finest and most experienced meditation teachers — with plenty of time for long meditations in our communities temples, shrines, and the Moksha Mandir. Graduates receive a Certificate of Completion and credits toward Level 2 yoga teacher certification (for Ananda Yoga Teacher Training graduates). Yoga Alliance RYT‘s and E-RYT‘s: up to 46 hours of continuing education credit. Based on years of experience and the use of new online learning technology we have created an online meditation teacher training that has all the instructions of our in-person training offers – and a great deal of personal attention and guidance from faculty. Our online environment is supported by onlinewithananda, a highly acclaimed online learning environment. Add to that regular post-training support, and you‘ll have all you need to become the best teacher you can be. Affordably priced. Yoga Alliance RYT‘s and E-RYT‘s: up to 80 hours of continuing education credit (non-contact hours). 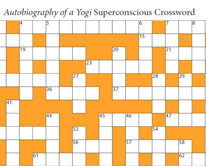 If you would revel in the inspiration and delight of Autobiography of a Yogi–in a way that will also boost your brain cells–we have a treat for you: The Autobiography of a Yogi Superconscious Crossword. Every clue is an excerpt from the Autobiography, with one word missing. Your job is to supply the missing word. It‘s fun, and you‘ll get lots of hints.